The Midwest is known for its notoriously frigid winters. Most recently with a polar vortex making its way through the region, many people have begun to question how to dress for a night out. Most notably, what to do with a winter coat and if one should be worn. 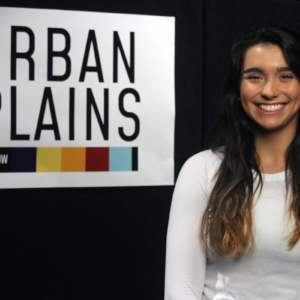 Young adults across Des Moines are forced to decide between wearing or leaving their coats when going out to local clubs and bars. 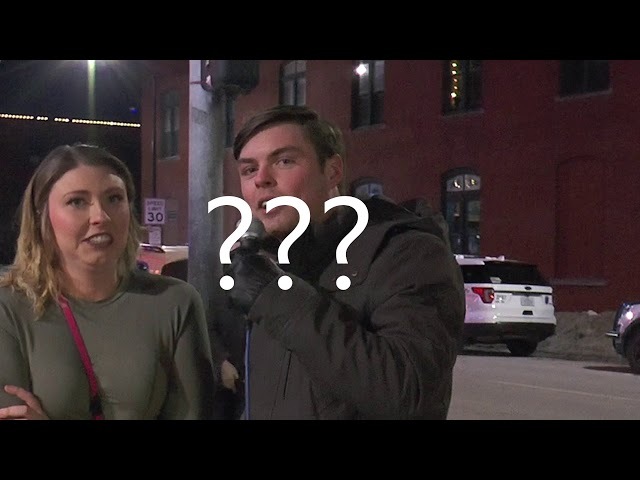 Sixty young adults who regularly attend bars or clubs in the Des Moines area took the time to fill out an online survey about their experience with coats on a night out and if there is a need for coat checks. Because people in Iowa and many other Midwest states experience brutal winter weather, developing frostbite can only take a matter of minutes if someone is not dressed properly. “Bringing a coat out becomes a hassle,” Michelle Thommie, age 23, says. “Once you get to the bar, you don’t want to have to hold it the whole night or leave it somewhere to get stolen. It’s almost just better not even bring it. But depending on how far you’re traveling, or the weather, you might not be able to leave without it.” Thommie isn’t the only one who views having her coat on a night out as a hassle. Of the people surveyed, 45 percent said they don’t wear a coat or jacket when they are going out. About 40 percent also said they have experienced their coat or belongings getting stolen or misplaced when they do wear or take belongings to bars or clubs. Despite this issue, establishments in the area are not providing coat check services for their customers. 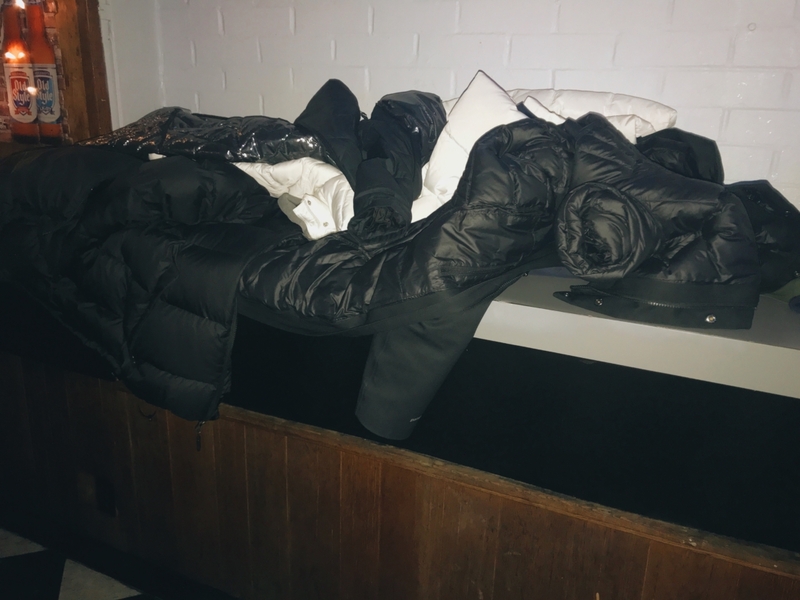 Chris Smithson, an owner of downtown Des Moines bar, Heroes, sees both the benefits and disadvantages of having a coat check. On an average Saturday night, Heroes pulls in about 500 to 600 customers. “A lot of people don’t even come in with a coat, and if they do, it gets set on a chair or table for the night,” Smithson says. He also mentions he gets several calls or customers coming up to him about the misplacement of their coat. Just like most lost items, if it’s still in his bar at the end of the night, he’ll hold on to it to see if the owner comes to claim it. Smithson believes the complications of having a coat check outweigh the benefits. 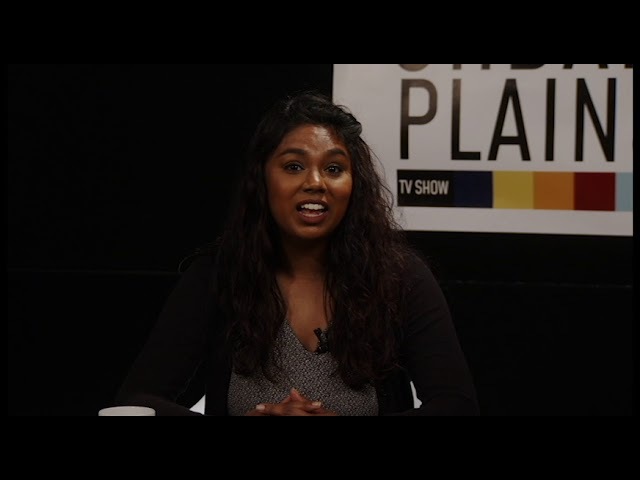 “I don’t have the space to start with. 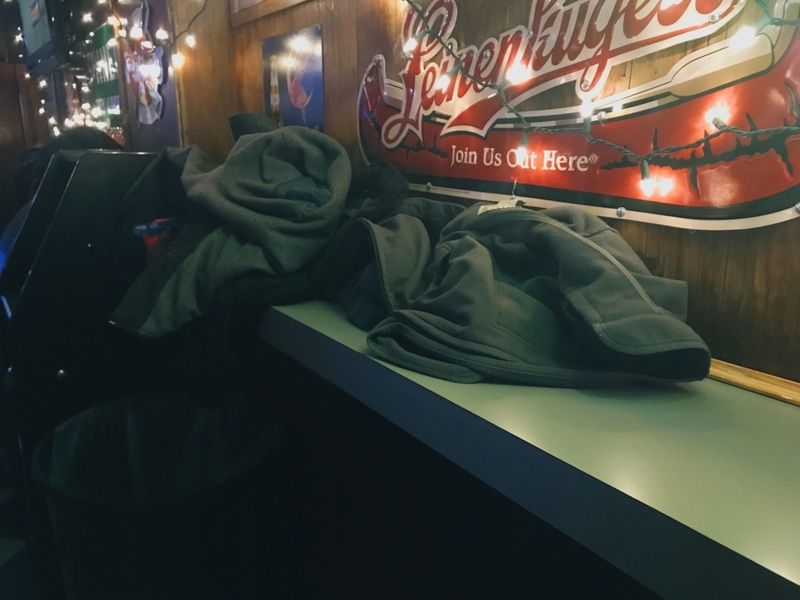 Holding at least 100 coats would take away significant space in the bar,” he claims. He also says that when designing or creating a bar, the need for extra storage for coats is not usually included in design options. “You also run into the issue of having to hire someone to babysit 100 coats. It’s easy to find people to bartend or wait tables because they’ll make good money in tips. Coat checks don’t typically make much in tips,” Smithson says. He believes he would have to pay the employee a significant amount to compensate their time, and after that rate, he faces the struggle of losing money off a coat check. 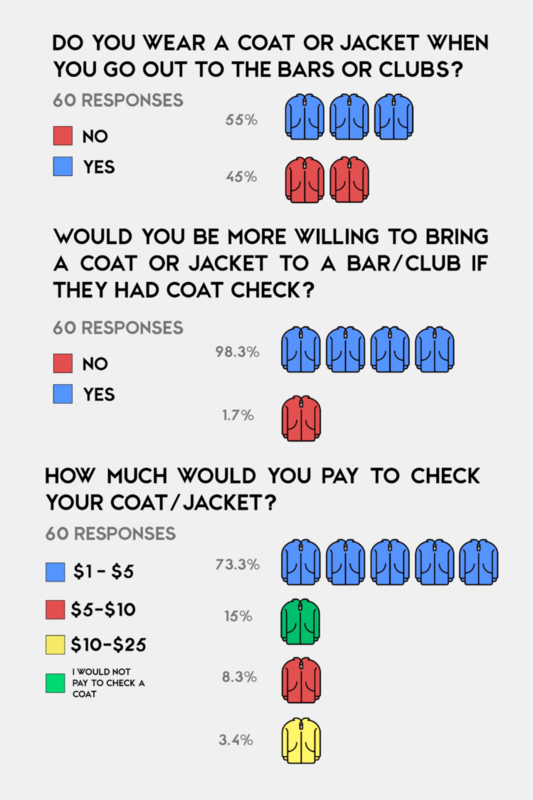 The survey also asked young adults how much they would be willing to spend on a coat check. All of the people who took the survey said they would be more willing to bring a coat out if the establishment they were headed to had a coat check. A large majority said they would pay between one to five dollars to check a coat. Fifteen percent said they would not pay to check a coat, followed by the remaining survey takers at 8.3 percent who said they would pay between five to ten dollars to check a coat, and 3.4 percent said they would be willing to pay even higher. Despite the positive feedback of having a coat check, Smithson doesn’t truly believe people would be willing to pay for the service once arriving. “The problem with surveys is that people say they would do it in theory, but once it’s time to pull out the wallet they won’t want to pay,” Smithson says. Both Smithson and Thommie agree that bringing a coat depends on location and plans. “If my friends and I are planning on a walking a few blocks then yeah, I’d probably need to bring a coat,” Thommie says. “With Uber becoming so popular, people are only outside for a short period of time. They know they’re coming from a warm car straight to a warm bar, so there isn’t much need for them to bring a coat,” Smithson says. Des Moines isn’t the only place in the Midwest where people have noticed a possible need for coat checks. Former Indiana University student Derek Pacqué saw a market need and created a business known as CoatChex, a coat check system that gets rid of the claim ticket and uses technology to advance the ease of checking a coat. Pacqué appeared on Shark Tank in 2012, turning down an offer from Mark Cuban. Even without an investment from a shark, CoatChex has taken off. Pacqué has moved his company to New York to continue to grow his business. Several bars, clubs and restaurants are using Pacqué’s system for checking coats. Even though Pacqué discovered a need for more coat checks in the Midwest, moving his company to New York City was a lucrative business decision. In Smithson’s experience, he can see why that move was essential for Pacqué’s business. “The only places I have been to that have a coat check are big clubs in big cities. Heroes just doesn’t have the space or crowd to support a coat check system,” Smithson says. Without large scale bars and clubs in the Des Moines area, bar-goers like Michelle Thommie will continue to debate the pros and cons of wearing a coat.